Complete with original sword knot, this is a very rare 1938 model IMperial Japanese NCO's shin gunto with unusual menuki similar to that of Imperial Household staff. 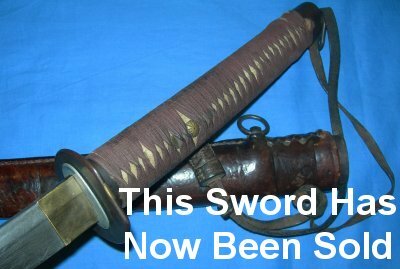 Please see page 78 of Richard Fuller and Ron Gregory's reference book "Japanese Military and Civil Sword and Dirks", referring to "Swords of Imperial Japan 1868-1945; this sword is so rare even Mr. Fuller and Gregory never saw / handled one themselves. The NCO version, first appearing in May 1938, which later was adopted as the late war 1944 / 1945 officer's sword. The menuki is different to the normal 5 petal Chrysanthemum, more like a simplified version of the Imperial Household staff's menuki. Which may explain a lot, and why this sword is so rare. The blade is clearly not your average machine made blade, having apparent ji-nie suggesting it was hand forged. The tang with taka-no-ha file markings has the typical 2 mekugi-ana peg holes. The 27 1/2 inch is still sharp from its period sharpening and has a few small ominous nicks. The original leather NCO's sword knot is fair, having aged somewhat and broken in one place, or perhaps cut. The very high quality cow hide leather field scabbard has aging to the inner throat and wear to the drag area, but is exceptionally good otherwise and I repeat, very high quality. Don't blink as it may well be too late; I do not ever expect to see another of these. My reference number is 924 (396). Full sized / further images available upon request.